Brandy House Farm01547 510 282work Guest AccommodationIn its idyllic rural setting nestled into the hills above the village of Felindre, The Brandy House, once a traditional hill farm, now a small-holding is the perfect place for a peaceful and relaxing break. Ideal for exploring the still undiscovered beauty of the Radnorshire/Shropshire borders and visiting Mid-Wales with its many attractions. 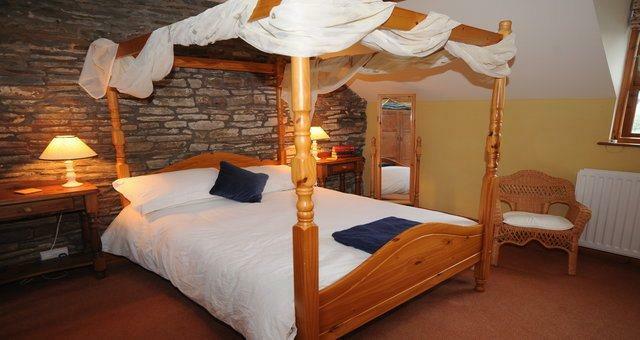 We offer you modern standards of comfort in a traditional setting, either within the farmhouse or in our converted stone barn and have a choice of twin, double, four poster or family rooms available. 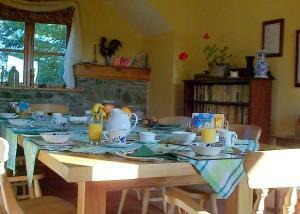 All have been carefully furnished with attention to detail and have either en-suite or private facilities. The grid shows the prices and daily availability from Tue 23 Apr 19 to Tue 30 Apr 19. It's easy to check availability for particular dates; just use the calendar to choose the check in date, select the number of nights and click the 'Search' button. Click the Book Now or Book Direct button to book the highlighted days. With Book Now the room booking will be confirmed immediately, with Book Direct the room reservation will be confirmed within 24 hours.. In its idyllic rural setting nestled into the hills above the village of Felindre, The Brandy House, once a traditional hill farm, now a small-holding is the perfect place for a peaceful and relaxing break. Ideal for exploring the still undiscovered beauty of the Radnorshire/Shropshire borders and visiting Mid-Wales with its many attractions. Delightful bridle and footpaths lead from the doorstep up onto wonderful open hills where there are endless opportunities for walking, cycling and riding. We have a drying room and washdown facilities for walkers and cyclists. Stabling and grazing for guests' own horses. Access onto 5000 acres of crown nature reserve, perfect for walking, cycling and riding. Children welcome from any age. The Brandy House is on the edge of the village of Felindre which is 10 miles from Knighton and 12 miles from Newtown on the B4355. If you are approaching from Knighton, turn up a sharp left as you pass the speed limit sign on reaching the village, opposite the village sign (please note that the Brandy House is not signed). Continue up the lane over the two cattle-grids and we are at the top about 150 metres from the main road. If you are approaching from Newtown, leave on the A483 (signed Llandrindod Wells) to Dolfor. Turn left onto the B4355. Go through the village of Felindre and as you leave it, turn up to your right just before the end of speed limit sign (please note that the Brandy House is not signed). Continue up the lane over the two cattle-grids and we are at the top about 150 metres from the main road.